Adelaide’s GPO Exchange has always been home to high-tech wonders, including the state’s first telephone exchange. Today a tech masterplan is central to its makeover, says RCP’s Tom Dalrymple. A $250million makeover by Charter Hall will deliver a new 22-storey commercial tower, retail outlets and a laneway precinct, while the iconic Telephone Exchange is being refurbished as boutique office space. The GPO Building was opened to great fanfare in 1872. At the time, it was the most expensive building erected by the colonial government in South Australia, costing more than £55,000. From its earliest days, the building was a hub of high technology, and was extended in 1908 to accommodate the state’s first telephone exchange. 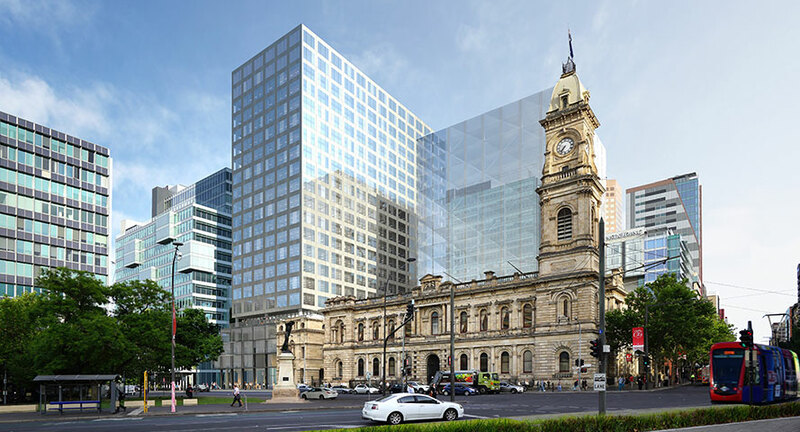 Dalrymple, an associate in RCP’s Adelaide office, has been leading the project management team overseeing the new tower and upgrading the exchange building, and applauds Charter Hall’s “tech-focused” program. “When a project takes years to complete, keeping pace with the rapid rate of technological change can be extremely difficult,” he says. Charter Hall and its team has overcome this challenge by developing a “tech masterplan” which is central to the project brief. “This plan outlines how technology will be implemented throughout the design, construction and operations. Some of these technologies aren’t available yet, but will be by the time the project concludes in two years,” Dalrymple says. The tech masterplan outlines everything from the building management systems to the lighting, “right down to the way building gathers data” and how “technology can help tenants understand how the building is performing”. Dalrymple says his project management team had needed to “work at two very different speeds”.